This photograph has been scaled down; full resolution photograph is available here (744 by 463 pixels). The Yamato is the most beautiful ship to ever float. The above picture is a dynamic scene of power and motion. What an amazing huge ship. It was a killing machine. She didn't have much of a chance, however against airplane bombs. The US Iowa class would have decimated this overweight clumsy boxer with it's vastly superior accuracy! Responding to Iowa Buff’s post at the 1 of June, 2012. That battle would simple have to depend on the circumstances overall, however we will never truly know as the US recognized the threat of the ship and simply found that the counter to such ships were simply the use of many aircraft focusing their fire onto a single target. However, to say it’s accuracy was far superior is about as good as propaganda from the American side as even with radar directed fire control for the main battery, it didn’t make much more than maybe half a percent or one percent difference overall to accuracy due to different conditions that could occur. So while it was still better, it was not ‘vastly’. Secondly, Yamato had a larger ‘immunity zone’ per say from Iowa’s shells of aprox. 20-26 kilometers due to the thickness of the armor and their angling relative to the shell’s trajectory. Comparatively speaking, the Iowa class would only roughly have a 20-22 kilometer safety zone due to the armor being thinner having thought the Japanese shell caliber would be similar to the American and testing off of that. 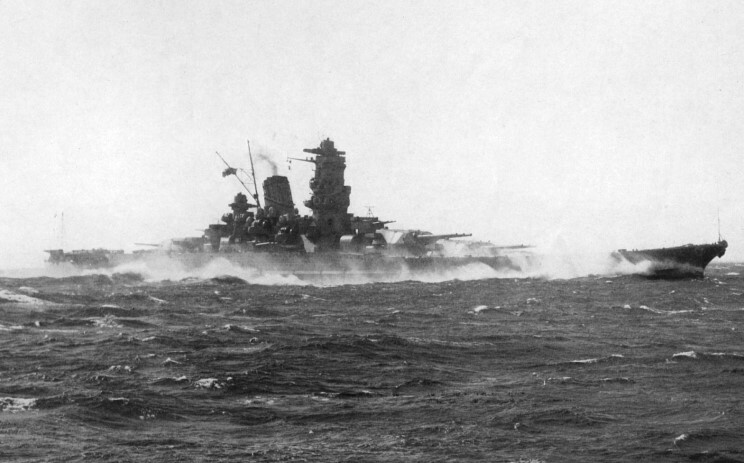 In terms of armor itself, the Yamato was at an advantage as the turret faces were virtually impenatrable at range with the accuracy required to hit any weak spot on them making it even less possible to begin with. The fight would more depend on Iowa taking potshots at long range and using it’s faster speed to avoid closer confrontation and hoping that the shells land at the distance required. Yamato has an edge in this category as her guns outranged the Iowa class. Yamato’s fire control was a large main optical director located in the main pagoda and just below the radar systems in place, which while being worse than radar directed fire, was noted to be concentrated due to naval training. Iowa would still hold an edge in accuracy in hampered visual conditions or a night battle as radar isn’t affected while optics are, but the difference is more or less marginal. If the captain of Iowa was to fall for having the false knowledge of the gun’s potention, and move into what he assumed was an immunity zone of fire, Yamato could take hits to her main armor belt without taking as much damage as Iowa likely would from taking the same hits to her weaker belt itself. If the ships were to close in even more, the fire director wouldn’t make much of a difference between them as the main guns are close enough it won’t make as much a difference. Secondaries may open up between them in which case it’s up for debate which may win due to simply what could happen. In the end, the long range battle would be in favor of Iowa though both may run out of main gun shells before landing a hit at all, at medium range the edge moved to Yamato’s favor, and at suicide range it’s up for debate. Iowa still holds an advantage in picking the battle when they wish however as well as in any sort of poor conditions. Long story short- Iowa was made with more technology and was still better, but not necessarily vastly superior. Yamato was made late 1930 early 1940’s with Iowa being made a year or two later.